After two and a half years, I am 93% finished with the animation: just four more Super 8 cartridges to get through (that’s about 12 minutes). Compared to the three hours of footage I’ve already filmed, it hardly seems like anything at all. Three hours of Super 8 animation equals approximately 216,000 individual frames. The film will be between 80 and 90 minutes long. Mustard gas. Monkey meat. Nerve-shattering bombardments, scything machine gun fire, furious hand-to-hand combat. Urban fighting, woodland fighting, headlong plunges through golden grain fields. 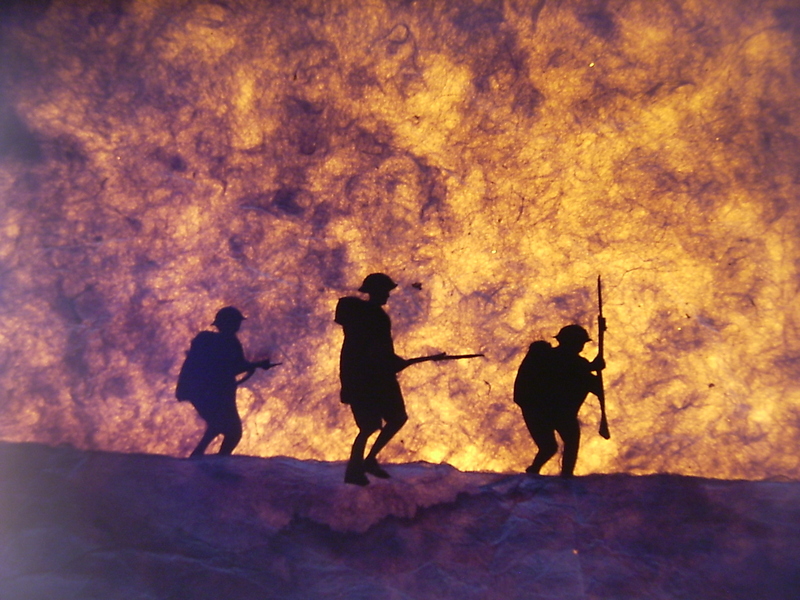 If it was in the experience of the average American Doughboy in WWI, it’s in my movie, made entirely out of paper and filmed one frame at a time. The battles — Cantigny, Belleau Wood, the Meuse-Argonne — are thoroughly filmed at this point. What remains is a good detail of detail work (adding more horses and airplanes, basically) and fleshing out the Transatlantic voyages to and from France. Almost everything I need is already designed and cut out. I just need another month or so to to film it all. It was a good idea (though completely accidental) that I decided not to shoot the film in chronological order; I’ve gotten better as I’ve gone along, and the opening scenes should be much stronger for that. Next (meaning hopefully by September) comes the “sound phase” of the project begins. I don’t know how long it will take composer Jason Staczek to complete his work, but for me things should start going a whole lot faster with the animation out of the way. Christmas? Not out of the question. My solemn vow is to have some version ready to show at our local (Missoula, Montana) documentary film festival in February. I urge interested persons to get in touch with me at the address below to request a more extensive private peek into the work-in-progress. I would also encourage people interested in supporting this project (which has so far scraped by on a successful 2012 Kickstarter campaign and a small grant from the state film office) to contribute in the coolest way imaginable: by buying a custom-made silhouette cameo. There are two ways to do this: by purchasing the service in my And We Were Young-themed Esty shop linked here, or by contacting me directly at the e-mail address below. What could be better than the combined satisfaction supporting the most amazing movie ever AND getting to make a personal silhouette appearance in it? But the offer won’t last: when I set down my X-acto knife at the end of August, the window is closed. 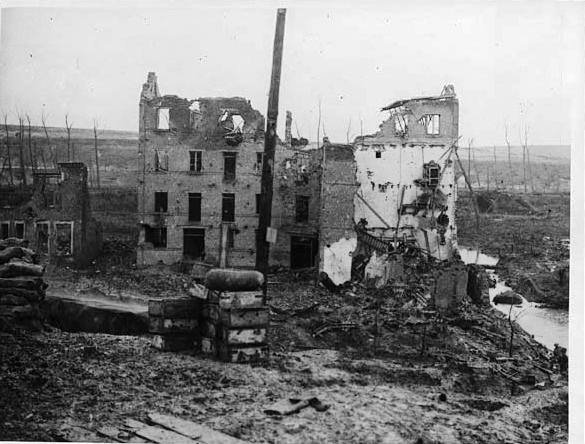 The Allies, including the Americans, attacked on the Meuse-Argonne in France on Sept. 26, 1918, and fought on there till the end of the war. 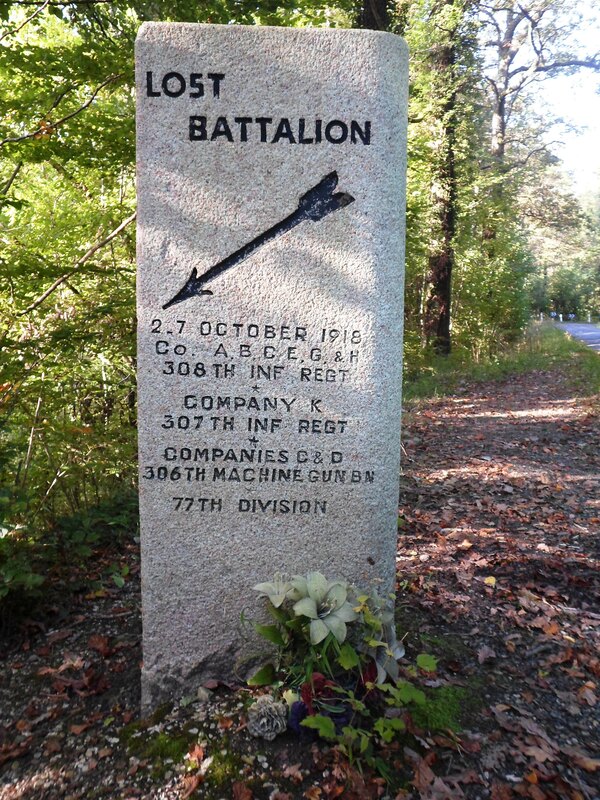 One of the most famous incidents of the battle was the losing of the Lost Battalion (not a battalion and not lost, as Clive Harris, Battle Honours guide, likes to shout). Here’s a good link about that aspect of the battle. Here is the monument to honor the American capture of the high ground at Montfaucon, about six miles from the Meuse-Argonne American Cemetery. 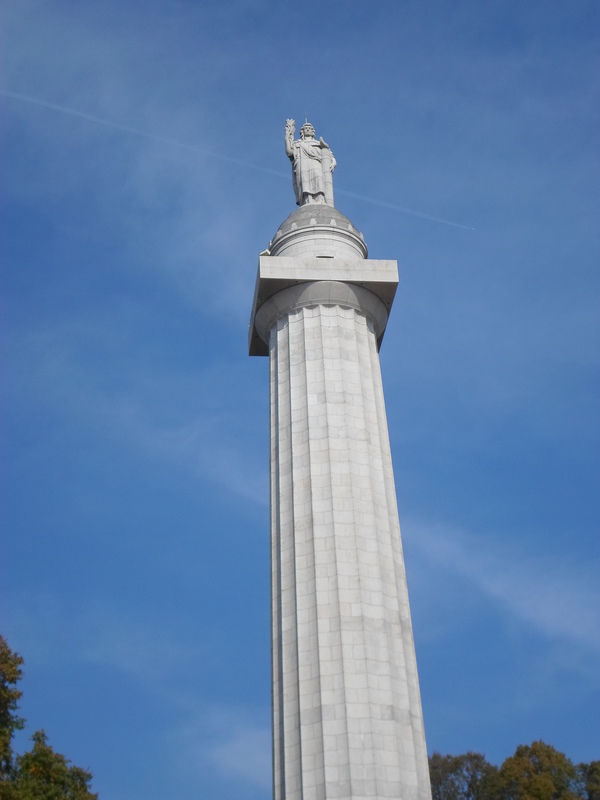 The monument has 264 steps up to a 360-degree observation platform. The memorial towers over the ruins of the church — all that is left of the village. So, the paper Meuse-Argonne is coming to a movie screen near you — sometime in the future. 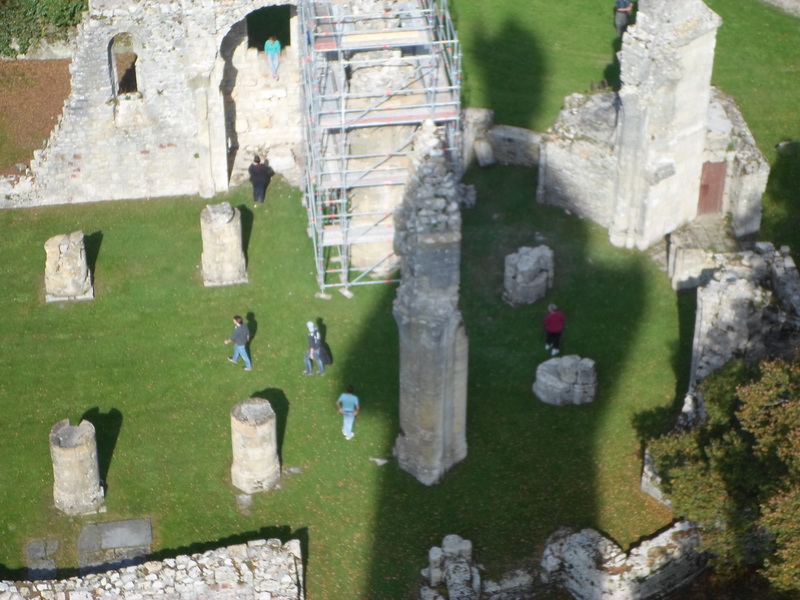 I’m very excited to see it, as my many posts on the subject will attest, because it’s all done in silhouette. 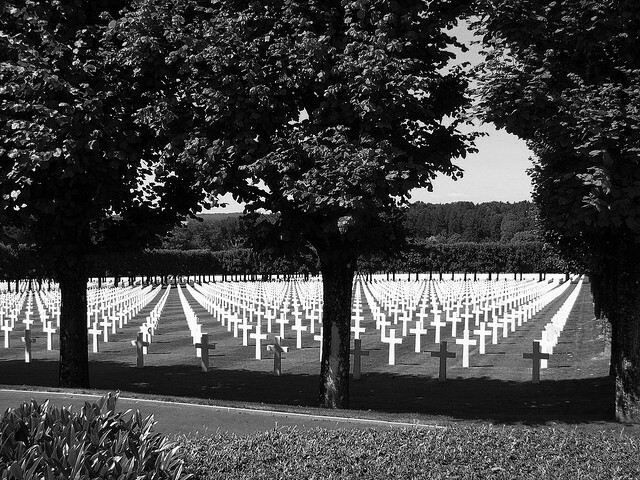 Here’s video from the 2011 Memorial Day ceremony at the Meuse-Argonne American Cemetery, just east of Romagne, France. I attended the 2009 ceremony at the cemetery where 14,246 American troops lie. It was very moving, especially to travel through the village of Romagne where the Stars and Stripes hung at every window. This video begins with the French national anthem (much better sung than in “Casablanca”). Following is Taps. Tears are running down my face. I keep meaning to pass on this info and then forgetting. Andy Smetanka is an animator making a film, “And We Were Young,” about American soldiers in WWI, inspired by the Meuse-Argonne campaign. He makes his images by hand-cutting paper — did you ever have one of those silhouettes done of your profile at a fair or somewhere? And then you turned out like this? Paper silhouette by Kathryn Flocken. Andy Smetanka’s paper cuts are not sweet little children. They’re soldiers, blasted trees, barbed wire, explosions, etc. His project needs money. Kickstarter.com is a website that lets small projects attract small (or big) donations, so you can become part of “And We Were Young” with just a few (or a lot of) bucks. 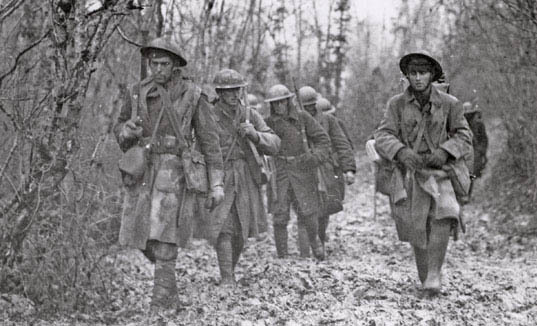 American soldiers trudging through the Argonne Forest.